The fences around the new Fremantle tourist signs are coming down, so I finally had a chance to have a good look at them. The $ 600,000 project is no doubt high impact and a huge improvement but a few things bother me. The Aboriginal art work by Peter Farmer on the bottom of the signs is barely recognisable as it is too dark and that is a real shame. The angle I photographed the sign from is the best way of seeing the art just a bit, but from a standing position there is not much to see. I also fear the lettering might be a bit too small, for older tourists especially, and that is not good service to the cruise ship passengers. While the signs are easy to spot I wonder if some simple finger signs will be added around town, as that often is the easiest way of discovering a city. 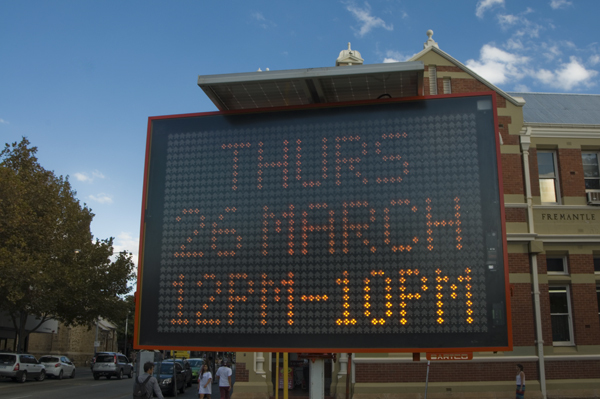 Overall though I believe the signs will significantly improve the Freo experience for our visitors.